We know that you don't furnish your office every day, so when you do you need it to be as easy and pain free as possible. 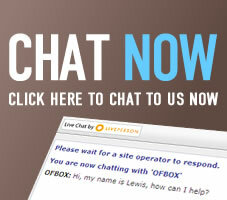 At Officefurniturebox.com, we make sure that all of our customers have a personal point of contact should they have any queries or comments about their order, or any questions about our range of products. Once we've personally checked your order, we'll be in touch to let you know that everything is underway and under control. Equally, if there are any potential discrepancies in your order then we'll be sure to clarify them with you to make sure that everything's correct. Although these are rare, they can occur occasionally if the selected ranges aren't compatible, if we need clarification of your space to be sure everything will fit, or even just to see if you'll benefit from our fit out and installation service. We also have a dedicated and friendly sales team on hand to help you when you need. You can get in touch by giving us a call, chatting on our Livechat function or by dropping us an email, whichever way you find most convenient! However you choose to get in touch, we'll always aim to get back to you as quickly as possible with all the information you need. If you need help with space planning, designs or finish selection then we're on hand to help, with free services and samples to really wet your furniture appetite. Our sales team are never pushy, and will always be sure to give you the freedom to work at your own pace and within your own parameters - so you won't ever feel pressured! We find that this approach works wonders: we believe we've found a balance between the speedy automated system that many people enjoy and the ever popular personal touch. There's help at hand for those who need it, but also the option to order at night in your pyjamas - if you're so inclined! But of course we'd say that - so why not find out for yourself? Get in touch and see if you agree, you've got absolutely nothing to lose, but a lot to gain when it comes to top quality service and more than fair prices!